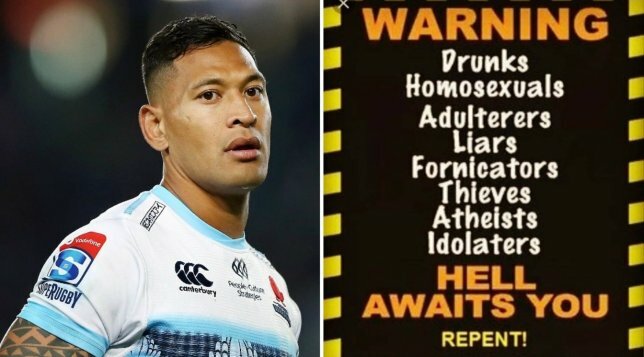 Hell awaits all of the above, according to Israel Folau! Two Tongan rugby players, both of them born in Australia, although one of them now plays for England, are in hot water after making robust comments about their religious beliefs. One of them (pictured above) made a post on social media that asserted various categories of people would all go to Hell unless they repented and embraced Jesus Christ. The list included homosexuals ( a ‘protected’ category of people, apparently) causing the rugby authorities in Australia (presumably atheists also worried about going to Hell!) to sack the rugby player from the national team. Seemingly, Israel Folau will now miss the Rugby World Cup, which is to be held in Japan later this year. However, he appears unrepentant as the post responsible for his sacking still appears on his Instagram account. The other Tongan rugby player, Billy Vunipola, who is also a devout Christian, defended the post by his fellow co-religionist and ethnic Tongan. As a result, he will be asked to explain himself following the row and may face sanction from the English rugby authorities. Despite his supportive remarks, he is unlikely to be dropped from England’s rugby squad, apparently. Just like football (which is seeking to purge ‘racism’ from the game) rugby is also embracing a politically correct agenda in seeking to purge robust views (in this case, concerning homosexuality) from the sport.